Forget the Flowers This Mother's Day. We Know Exactly What She Wants. Forget the Flowers This Mother’s Day. We Know Exactly What She Wants. What more can be said about our amazing mothers? They have known us the longest, changed our diapers and put up with us in our teen years and they still love us. We truly owe them our life. After all they have done for us, doesn’t it seem like a single day of celebration is not enough? We certainly feel that way. With that being said, some of you may be feeling the pressure to make the one ‘official’ day that they have the best it can be. 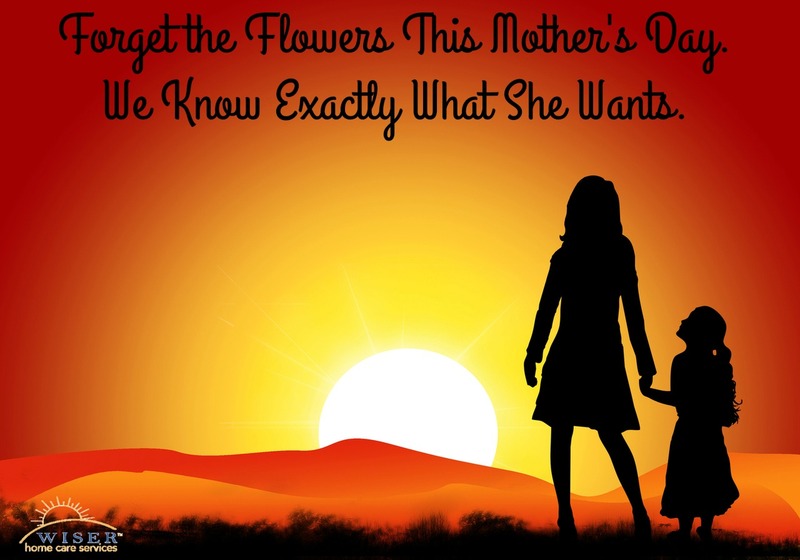 So, what can you do to make your mother’s special day the best it possibly can be? What if she already has it, or what if she doesn’t like it? Is it good enough? These are valid questions that make finding the perfect present for mom difficult. Over our years of caregiving experience we have learned a lot about what our elderly loved one’s like. Below are some ideas to get you started. Our elderly loved ones often have hundreds if not thousands of photos of years past in albums or simply laying around. As a gift, you could scan these onto a computer, zip drive or the cloud. This way they will be safe for years to come and will be easily accessible to view. We all know our elderly loved ones enjoy playing card games and board games, but did you know that playing video games has recently become a popular trend for the elderly? It might be out of the ordinary but grandma may love a new gaming system. Video games are not only a great way to pass the time but give our senior loved ones a good brain and body workout, which can also help fight dementia. Did you know that loved ones over the age of 85 have the highest fire death and injury rates of any age group? Keep grandma safe by investing in some flameless candles. They give off the same amount of light but keep grandma safe in the process. Everyone loves food and most can agree that having someone cook for you is a nice break from the norm. Whether you buy grandma a monthly subscription to a food service or you cook her several meals that can be frozen and eaten later, she will love them. Does grandma have a DVR, tablet, smartphone, computer or a social media account? Modern technology is amazing, but can be difficult and frustrating for elderly loved ones to teach themselves how to use. Instead of buying grandma something, spend some time with her and teach her how to use it properly. You could even help them set it up with fun and helpful apps or games for them to use. Although getting a gift is always nice, we can guarantee you that your elderly loved one would almost certainly rather spend time with you. Below we have gathered some fun Mother’s Day activities you could do with your mom or grandma. Take her out to eat at her favorite restaurant. Find a local garden and take her for a stroll through it to check out the flowers. Is she a sports fan? Find a local sporting event to attend. If she is religious, join her for her weekend service. Everyone loves shopping. Take her out to the mall and let her pick something out. Relax and watch her favorite movie or tv show with her.